Offering you a complete choice of products which include single girder eot cranes, eot crane, crane spare parts and hot cranes. 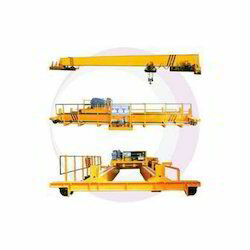 Single Girder EOT Cranes are widely used in many industrial and civil construction sites or other fields’ .We use premium quality raw materiel and high technology in its manufacturing process. Its Optimum Design ensures minimum Dead Weight, Wheel Loads, Head Rooms and Clearances. Its Forged Runner Wheels on Spherical Roller Bearings make it trouble free working. We offer a competitive price range for all our clients. 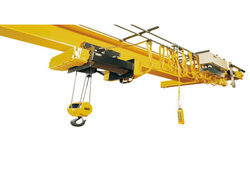 We are pleased to offer our unique product of EOT Crane that are fabricated using premium quality raw material and components like MS Sheets, MS angles, I beam, motor and brakes. We follow all international parameters in its manufacturing so for this reason it can bear loads ranging up to 300 tons due to its enhanced capacity. . These are precisely designed and provides manual long and cross travel facility with a provision for using either an electric hoist or a motorized chain pulley block. Our eminent clients appreciate it due to its reliability, special features and operational function. 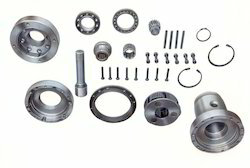 With the excellent support of our brilliant professionals, we are engaged in presenting Crane Spare Parts. Extensively demanded from mechanical, automobile, and wire manufacturing companies; the chain is appreciated due to providing accurate and align results to the clients. Moreover, the chain is available in various configurations to match up the growing industrial demands. The offered chain is manufactured using quality-tested spare parts, steel and other metals. 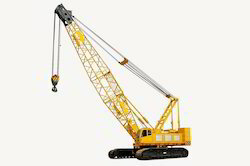 We also offer a premium quality of HOT Cranes which is widely used for heavy machine loading, material loading and unloading, light assembly work and many other fields. Our eminent clients appreciate these products due to its function, reliability and easy operational systems.